Welcome back to another weekly update of the new cards for Cardfight!! Vanguard. This week is a bit of an odd one as all the new cards shown have been the new G Guardians from Fighter’s Collection 2016. If you don’t know what a G Guardian is, they are a new form of G unit that have 15000 shield. They are brought out by discarding a Heal trigger in your guard step to bring them out from the G zone into the Guardian circle, then afterwards they go face-up into the G zone. You can’t have more than four face-up G Guardians in your G zone at a time. You can call multiple G Guardians into the Guardian circle at once (Providing you pay all their costs) as well as bringing out cards from the hand to guard as well. From what we have seen so far most of them gain +5000 shield while meeting conditions, so more often than not they will be a 20000 shield. Another benefit to these cards is that it gets past the ruling for “Your opponent can’t call cards from hand to (GC)” because you are bringing it from the G zone, this will help people a lot against things like Chronojet Dragon and Phantom Blaster “Diablo”. One last thing to note is that due to this new form of G unit the G zone has now been expanded and you can have up to sixteen cards in your G zone. Now that we’ve gone through the rules, let’s get to the actual cards. Gear Chronicle’s G Guardian was originally a Heal trigger that I’m sure most Gear Chronicle players will recognise, Retroactive Time Maiden, Uluru. When Uluru is placed on the GC you may put a normal unit and trigger unit from your drop zone to the bottom of your deck. If you did put two back in your deck then she gains +5000 shield. This is a great way to get Heal triggers back into your deck, and with Time Leap you’ll be able to shuffle deck, giving you a better chance to get those triggers again. Using Thunderbolt Shockwave Colossus will even allow you to turn Uluru face-down, while Uluru lets you put the heals back for even more G guarding! 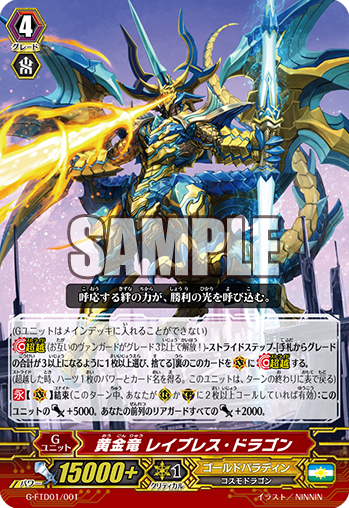 Royal Paladin’s G Guardian is a little less useful with Holy Dragon, Laserguard Dragon‘s skill just needing a Grade 2 on your field for him to get the +5000 shield, though Royal Paladin do already have some pretty good guarders with Kymbelinus, Hudiplus, and Scouting Owl. Laserguard does work well in most Royal Paladin decks but less so than most in a Sanctuary Guard deck that mostly relies on Grade 1s, though this doesn’t matter too much seeing as Sanctuary Guard decks are usually very fast and aggressive. I can only assume this was meant for modern Altmile decks with all the Grade 2 love in them but works well with all sorts like Jewel Knights, Blaster, and Alfred decks. Next up we have a new Dark Irregulars succubus, Fake Dark Wings, Agrat bat Mahlat. When Agrat bat Mahlat is placed on GC you must Soul Charge 2 and if your soul has six or more cards in it then she gains her +5000 shield. Having another way to Soul Charge in a Dark Irregulars deck is always handy and works great with the Blade Wings. 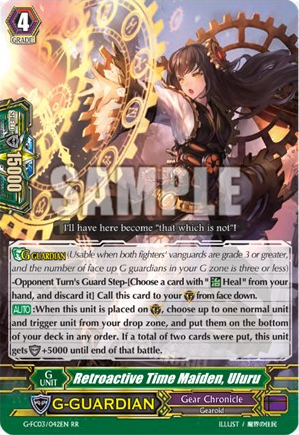 The only problem with a G Guardian in Dark Irregulars is with only being allowed four Heal triggers you may find yourself Soul Charging a lot of them, so you may not want to have four of this girl in your G zone. However, if you are using this a Blade Wing deck then at least you have Blade Wing Sullivan; Wings of Annihilation, Blade Wing Tibold; and soon Wings of Reincarnation, Blade Wing Reijy to get cards from your soul back into your deck. Sacred Heaven Prayer Master, Reia is the Gold Paladin G Guardian and similar to Laserguard, her condition is a bit more simple than others. When she blocks, if you have two or more rear-guards then she gains +5000 shield. This can be a bit troublesome against Narukami, Kagero, or even Link Joker but it isn’t hard for Golds to do this kind of thing against any other deck, considering you just cover your field in whatever you can with Gold Paladins. Golds will be getting more support in the next main set so let’s hope they get something a bit more exciting then. GR G Guardian Gurguit please! 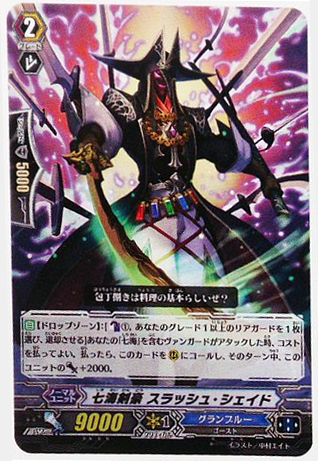 Link Joker’s Death Star-vader, Demon Maxwell has a very misleading name as his skill works so much better with Messiahs than Star-vaders. When Demon Maxwell is placed on GC you can lock one of your rear-guards in the back row and gain +5000 shield. This is a very good start for Messiahs to pull off their combos but with every other Link Joker deck it’s just… meh. It kind of hinders you but if you’re using this in a Glendios deck then you’re not really aiming for high power, just to lock your opponent down, so this may still prove useful for that. And following the misleading name convention we have Dimension Police’s Enigman Patriot who doesn’t have any Enigman specific skills. It’s not too bad this time around, at least you can use it properly in an Enigman deck. When your opponent is attacking with 20000 or more power than Patriot gets her +5000 shield. This means you’ll always be able to pull this off if your opponent has strode on that turn. This is not as good in a Zeal deck as Zeals usually lower your opponent’s power but considering her name is “Patriot” you can’t expect her to work too well with the villains, and like with Gold Paladins, Dimension Police will get some more support in the next main set so we can expect some more G Guardians for them there. Neo Nectar’s new dragon, Sacred Tree Dragon, Rain Breath Dragon, proves to be a very powerful defense. When he hits the GC you may put a card from your hand onto the field and it gains Resist, if you do place a card down then Rain Breath gets +5000 shield. If you wish, you could then intercept with the new unit (If it has intercept that is) and it wouldn’t be able to be retired by cards like Super Dimensional Robo, Daikaiser thanks to the Resist, and also helps with things like Kagero and Narukami. Lastly we have a promo G Guardian that is believed to be coming out as a box topper for Fighter’s Collection 2016. This promo is a Cray Elemental, Light Element, Agleam. When Agleam guards you don’t gain any more shield but you do get to draw a card, which could be a 10k shield that would allow you to guard more than the average G Guardian but it could also be a Grade 3 that doesn’t have any shield. I would recommend using this when you know it’s all you have to guard with because that way, even if it is a Grade 3, that’s going to help you on your turn and you may be lucky enough to draw something like a Perfect guard. If you are using situational G Guardians like the Royal Paladin and Gold Paladin ones then it would be good to run at least one or two of Agleam. Well that’s everything for this week. What do you guys think of the new G Guardians? Are you glad that you can now have sixteen G units or do you think it’s too much? Be sure to tell me your thoughts in the comments. Join me again for next week for more spoilers on the latest sets, decks, and promos. Welcome back to another weekly update of the new cards for Cardfight!! Vanguard. This week there are less cards than what we are used to being revealed in a week but the majority are very useful cards from Fighter’s Collection and Start Deck 2. The big stride of the Start Deck, Golden Dragon, Ray Breath Dragon, has made his appearance though the quantity that you’ll receive is still unclear. 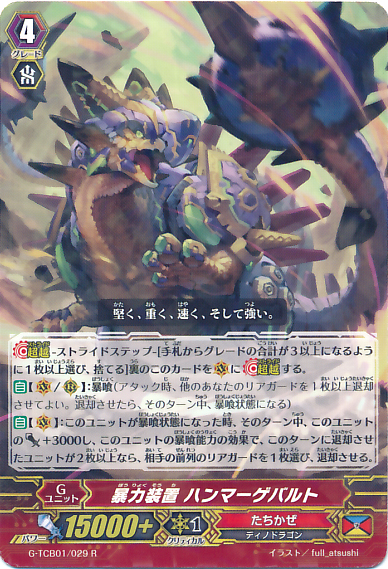 Ray Breath Dragon has the Unite keyword (When two or more cards are placed on rear-guard circle or guardian circle that turn) which gives him +5000 power and all rear-guards in the front row +2000 power. For a first stride this can prove to be very useful and can fix up what would normally be a weak column because your rear-guard would be boosted by something like Coolgal, Sleimy, and the new Unite Perfect Guard than I’m sure they’ll be getting in G-BT07. To help continue the rear-guard power we have Knight of Crimson Sun, Lenot. With a GB1 Lenot boosts for 9000 power as long as he is boosting a unit with the Unite keyword. A great thing to do is to combine this with the already shown Grade 2, Knight of New Sun, Catillus who gains +3000 when United making the column 21k making it a lot harder for your opponent to block the attacks, especially if you continue to combo this with Golden Dragon, Scourge Point Dragon. Now for Fighter’s Collection cards I will start with Granblue’s Demonic Sea Empress, Mairead. This stride has an ACT with the cost of CB1, G blast, and discarding a card. If you pay the cost then you can choose normal units equal to the amount of Maireads face-up in your G zone from your drop zone where their Grade’s add up to Grade 4 or less and call them to separate rear-guards. It will take a while to be able to use this lady effectively in a game but Obadiah will be a great way to prepare for her if you use him on the first stride, but if you’re using a Granblue deck then there’s a good chance you’ll be using Obadiah on the first stride regardless. The discard is a bit troublesome but the Counter Blast is not so much. If you’re at the point where you can call three units then you can call two Grade 2s or a Grade 3 and Grade 1 which still allows you to bring out Grenache to get those Counter Charges. Heavenly Deity of Guidance, Wakahirume is the OTT G unit for this set. With a GB2 and Oracle, and having a cost of CB1, SB1, and G Persona Blast, you get to draw a card when she attacks and choose a card from your hand and put it on top of your deck. This leaves you putting triggers on the top of your deck to them immediately trigger check it, a good reason to keep heals in your hand. The big problem people have with this card is that you have to have Oracle before your trigger check which can be hard for some OTT decks, though if you’re striding over the Grade 3 Susanoo then at least you get an extra draw on striding. Murakumo get an extremely useful stride for their current Grade 3 boss, Yasuie. When this new Ambush Demon Stealth Dragon, Onibi Blader hits the Vanguard circle you can choose a Grade 3 from your hand and bring it onto the field, then you can give another rear-guard +2000 power and the ability to attack a Vanguard from the back row. The reason this works so well with Yasuie is you can choose which order to use Onibi Blader’s and Yasuie’s skill so you would most likely use Onibi’s skill to bring something onto the field and then Yasuie’s to clone two more copies. 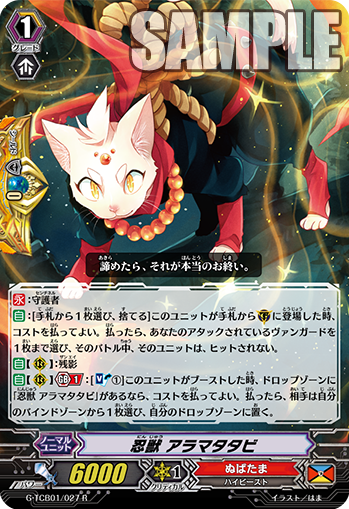 This card is simple but Murakumo needed it a lot because of how Yasuie’s skill would normally become useless if you don’t have the right set-up on the field before striding. Finally for Neo Nectar we have Flower Princess of Perpetual Summer, Verano. When this G unit is placed on the Vanguard circle you can SB1, G blast, and choose a card from your hand and the drop zone and put them into your deck. If you do all of this then choose two cards from your hand to bring to the field and choose a number of rear-guards equal to the number of Veranos face-up in your G zone and clone those rear-guards. After that, shuffle your deck and the new units get boost until the end of turn. There is no restriction on what cards you can put back into the deck so you can choose to put the things you plan to clone or if you have no duplicates in your hand then you can start putting triggers back into the deck and perfect guards that may have fell into your drop zone. That’s everything for this week. Join me again for next week for more spoilers on the latest sets, decks, and promos. Welcome back to another weekly update of the new cards for Cardfight!! Vanguard. This week we get a better look at what the new Fighter’s Collection has to offer so let’s dive right in a see if there are any cards that can help your clan. First off is Tachikaze with their new stride, Destruction Tyrant, Grado Gigant. When this unit attacks you can activate its Engorge ability which will give it +5000 power for each unit it consumes and if the number of units is three or more then you get to draw a card. This works especially well with Gaia Emperor allowing you to attack once again with two of the retired units and the draw will help you defend next turn just by getting rid of something minor like a draw trigger in your hand. This generally makes for a great first stride for Tachis and I would highly recommend having at least one of these in a Gaia Emperor deck. Next up we have a Genesis stride who acts like a mini Vanargandr. This new unit, Vanquishing Beast War Deity, Tyr, has an ACT that has you Soul Blast 3 to check the top card of your deck and choose whether to put it on the top or bottom of your deck. The Soul Blast gives you an additional skill where every time you are to reveal a Grade 1 or greater in your drive check then you Soul Charge 3. With this high amount of Soul Charging you will want to be careful on how many times you use this guy, I’d say using him once for your first stride would be good for a game but you may want a second one as backup. This is also a nice way to give cards like Mythic Beast, Hati and Mythic Snake, Jormungand a good power boost early, though Doom Brace can be an equally good unit to use for your first stride. Time for Nova Grapplers and they finally get the stride people were waiting for with Meteokaiser, Bustered. People are saying that this new card is a replacement for Victoplasma and I can see why. When Bustered attacks you can Counter Blast 1 and G Blast one G unit and you can restand an amount of rear-guards equal to the amount of face-up Meteokaiser, Bustereds in your G zone. If you do this then at the end of the battle, if you have five rear-guards, you can Counter Blast 1 again and drop two cards from your hand to restand Bustered but he only gets one drive check. Being to stand up himself and up to four rear-guards will be devastating for your opponent, especially with the new Rush skills but I’ve also heard that this works great for Beast Deities by them just constantly standing, forcing your opponent further and further back. There certainly seems to be a wide gap between GRs and RRRs in this set. As tradition with Neo Nectar our all-powerful stride is a cute little animal, and of course it looks like a cat with wings but apparently that makes it a dragon, this being Omniscience Dragon, Hrimthurs. At the end of the battle that this unit attacked a Vanguard you may Soul Blast 1 to give a rear-guard +4000 power, you may give them a second +4000 power and if you do they are retired at the end of the turn, if that unit had 20000 power or more when it was retired then you also get to draw a card. Combine this guy with Bigbelly and Crayon Tiger for more drawing and better chances of getting that 20000 power and luckily Hrimthurs doesn’t use and Counter Blasts which will help out the deck a lot. I’d recommend aiming the power boost at Guru Wolf and you can defend yourself for days with the amount of cards you’ll have in your hand. 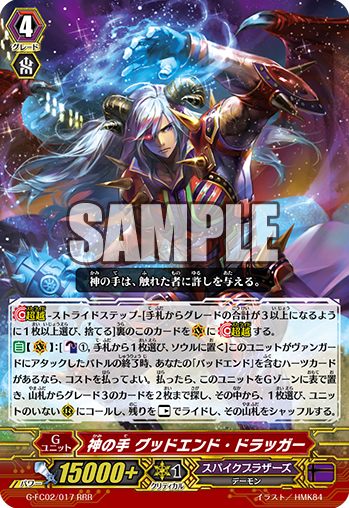 Rikudo Stealth Dragon, Gonrakan is a new stride for Nubatama that forces your opponent to choose two of their rear-guards when he hits the Vanguard circle and they have to put all other rear-guards in their bind zone. If three cards were put into the bind zone through this then your opponent chooses two cards in their bind zone and puts them into the drop zone and puts anything that wasn’t put into the drop zone into their hand at the end of the turn. To weed away their rear-guards further you can use Shiranui’s on-stride ability to stop those intercepts. 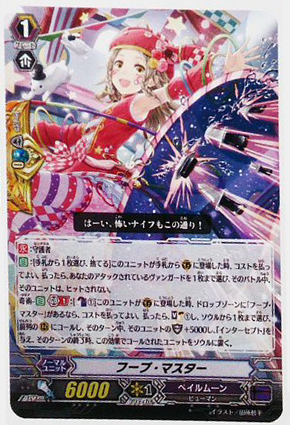 Lastly for this week’s Fighter’s Collection cards is Lucky Rise, Elprina the Bermuda Triangle stride who simple but so, so effective. With the ACT to Soul Blast 1 you can bounce two units back to your hand. You can only use this once per turn but it is crazy to let you sort out your field and then get amazing bounce benefits and will let you re-establish your Harmony skills. This can also be used to refuel yourself by bouncing units that will give you Soul Charges and Counter Charges. So for the new DAIGO deck coming out, along with Sanctuary Guard Dragon and Sanctuary Guard Guarantee we were promised a new Sanctuary Guard Grade 3, Sanctuary Guard Arc, and his skills have finally been revealed. Firstly his GB2 skill gives all Grade 1 and lower units +5000 power. So unlike Sanctuary Guard tradition of Grade 1s giving power, the power is given to the Grade 1s. 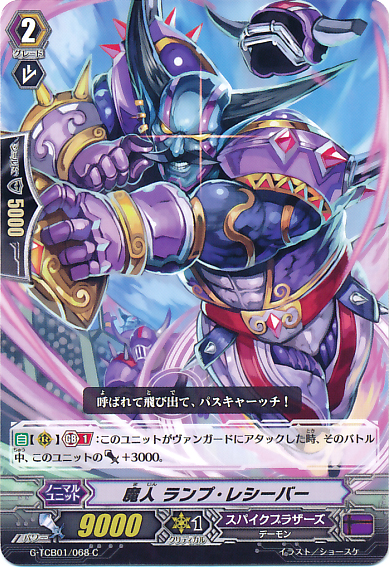 He also gets an on-stride ability to discard one card and search your deck for one Grade 1 or less and bring it onto the field, on top of that, the newly called unit and your Vanguard get +3000 power. As you can probably tell, this works amazingly well with Sanctuary Guard Regalie and we have yet to see what the skill of the new Sanctuary Guard Imperial stride but we can only guess that it will most likely word with having a large amount of Grade 1s as is Sanctuary Guard tradition. Daigo himself even gets a promo stride for Entrager. Sanctuary Guard DAIGO is just a vanilla stride unfortunately but due to him being Entrager the chances of us actually getting him in English is extremely slim. 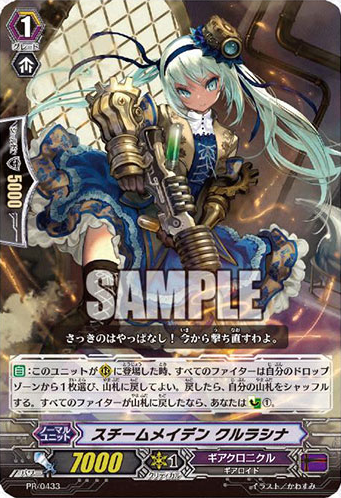 Continuing with the promo cards we have a Gear Chronicle card, Steam Maiden, Kuluracina. When she is placed on the rear-guard circle each player may put a card from their drop zone into their deck. If both players do put a card away then the player controlling Kuluracina gets to Counter Charge 1. Having to rely on your opponent to put one back into the deck is very risky. They may want to put their triggers or perfect guards back but they will probably think it’s not worth it if you’ll be able to pull off more deadly skills. For Kagero we have Dragon Knight, Pharrell, a 15k booster for Blazing units. He’s usually a 5k Grade 1 but if he’s boosting a unit with Blaze he boosts 10k and if that unit is Blazing then he gives 15k! This can lead to some very strong columns but we’ll have to see what kind of cards will have Blaze in the future. 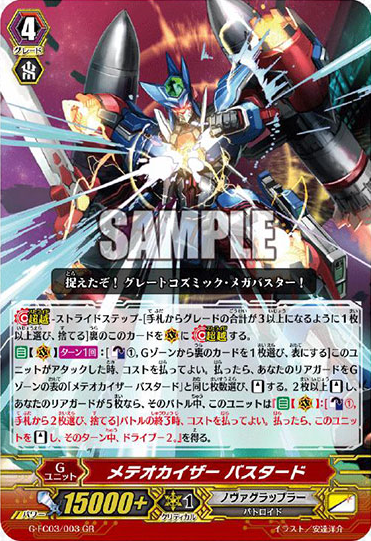 Lastly we have a Blaster Dark promo which has alternate art similar to the Blaster Blade promo recently. Blaster Blade’s art showed him with Thing Saver in the background where the new Blaster Dark has Phantom Blaster in the background. That’s everything for this week. Join me again for next week where there will most likely be more showing for Kagero’s new cards as well as more Fighter’s Collection cards and perhaps even some G-BT07 spoilers. Cardfight Vanguard singles are available to purchase at Big Orbit Cards: Cardfight Vanguard. Welcome again to the weekly Vanguard update. All the G-BT06 cards have finally been revealed so I will go over all the new cards shown for it but before I get into that large amount of cards I’ll quickly go over some of the Legend Deck and Starter Deck cards. 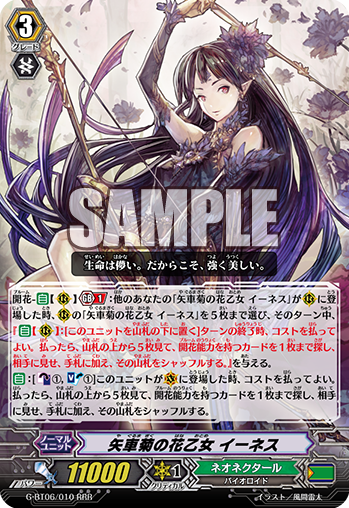 A stride for Kagero has been revealed for the Legend Deck. 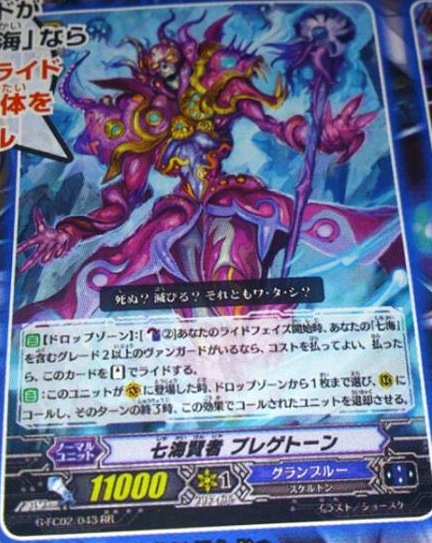 Supreme Heavenly Emperor Dragon, Vortex Desire (Wait.. are you the emperor or is Dragonic Overlord..? I’m so confused!) has a risk of having to pay the cost before the ability’s conditions are met. 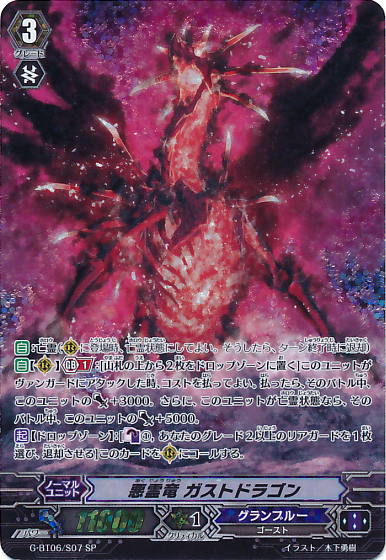 When Vortex Desire attacks you may G blast (Choose any face-down card in your G zone and turn it face-up) to then gain the ability where if his attack hits you choose one of your opponent’s Grade 2 or less rear-guards and retire it for every Flame Dragon on the Vanguard circle. 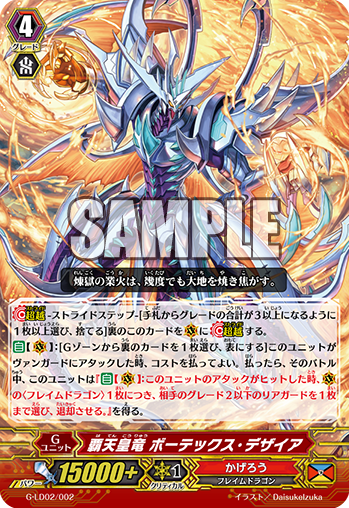 This basically means if you have Dragonic Overlord (Just an example of a card with the race of Flame Dragon) as your Grade 3 Vanguard you’ll be able to retire two units as Vortex Desire is a Flame Dragon himself, and if you were to have Vortex Dragonewt and your Vanguard while legion’d and you stride then you can retire three. Say that Mr. Vortex’s attack doesn’t hit, that doesn’t mean his attack will go in vain. 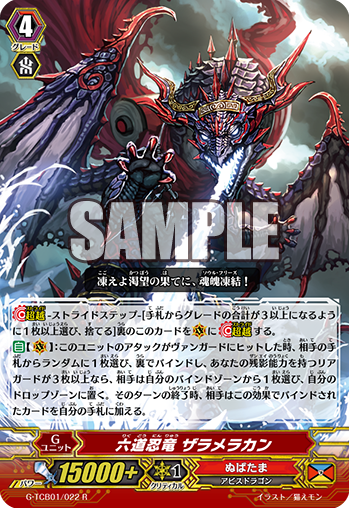 With the twin-headed dragon, Berserk Lord Dragon you can Counter Blast 1 when your Grade 4 Vanguard attacks to retire one of your opponent’s Grade 2 or less rear-guards. This along with Emperor Dragon Knight, Nehalem makes the most of using more Grade 3s in your deck so you can stride more consistently. Who remembers Undeux? Probably those of you who didn’t exile him from your deck as soon as you got Conroe to replace him. Well he’s been crying lonely tears for a long time now, for so long that his sadness has made him stronger. He is just a Fullbau Brave with the ability to go into the soul and put an Overlord from your deck but this helps a lot more with Overlord decks than Blaster, especially with Dragonic Overlord “The Ace”. In the new G Start Deck 1 for Gear Chronicle we’ve been told that it will all be reprints apart from one card. 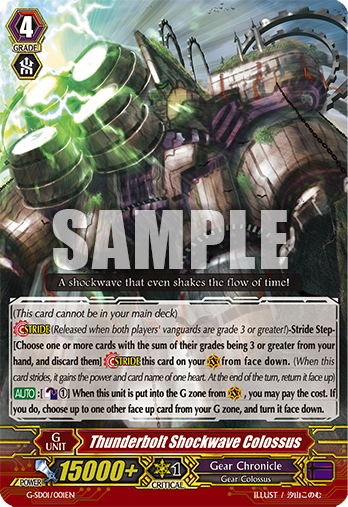 That card is the Grade 4 unit, Thunderbolt Shockwave Colossus. This card is a G zone refresher of sorts which, when he goes back into the G zone, can Counter Blast 1 to turn one face-up G unit face-down, allowing you to use those units again. This unit can have it’s uses but the Counter Blast hurts it a bit and you might struggle to find room for it. There are other options like Wakey Wakey Worker who doesn’t use up Counter Blasts but you’ll have to decide if you want to run stands just for him or now. Onto the G-BT06 cards and staying in the Dark Zone I will introduce our lovely new Pale Moon units! The first one being the Grade 1, Cutie Paratrooper, an extremely useful but Harri specific card. With a GB1 and when she’s brought out from the soul from a Magia ability, Soul Charge 1 and choose another unit from the soul to Magia out in the same column as this card and that new unit gets +5000 power. With Harri’s skill you can call Cutie Paratrooper out with CB1 and give her +5000 power and then use her skill to fill the rest of the column and giving the column a total boost of +10000 power… That’s nasty. Now Artillery Man isn’t the best Grade 3 ever but I really like him and I feel that he would at least make a good backup. Once per turn with a GB1 when a card is put into your soul you may retire one of your opponent’s rear-guards with the same Grade as the card put into your soul, as well as that he has another once per turn skill that allows you to put a card going into your soul into the drop zone instead and Artillery Man him self gains power equal to the card put in the drop zone. The second skill isn’t GB1 restricted so pulling off some early powerful plays will help you and if your opponent decides to stall on Grade 2 then you have a skill to back you up. Gold Paladin’s skills have been stolen yet again, this time by Dreaming Pegasus. When this Grade 2 is placed on the rear-guard circle, with a GB1, look at the top three cards of your deck and put one into your soul and put the rest to the bottom of your deck. With Granblue getting Disappear-running Zombie it does seem that Pale Moon drew the short straw with this skill, though it is still powerful. Now, if you’re looking for a card for early game then Pale Moon do have a new 6k Grade 1, Signal Snake Tamer. With a CB1 and resting himself Snake Tamer will let you look at the top card of your deck and search your soul for a card with the same Grade and bring it out to field. I know I said this was early game, and technically it is, but if you want to use this skill to its fullest then I’m afraid you’ll need to do some setting up first. Chances are when you have a Grade 1 Vanguard that you’ll have a very small soul or most of the time no soul at all. It is a shame and if they gave him 7000 power he might have been used more but this little unit may be going to the backbench, though I hope someone can find a good use for him and maybe one day I’ll see him in competitive play. Lastly for Pale Moon we have a Silver Thorn critical trigger, Silver Thorn Assistant, Dixie, to give support to Luquier. 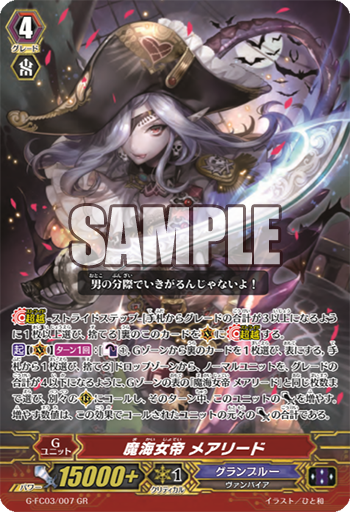 Her skill is short and simple allowing you to put her to the top of your deck and shuffle if you have a Luquier Vanguard to choose a Silver Thorn in your soul and bring it out onto the field. This can be used to bring herself out from the soul if she got accidentally soul charge’d in to then put more triggers back into the deck. A couple of weeks ago we saw the new Ahsha stride and now it’s time for Altmile to get his glorious new form. Transcending the Heavens, Altmile has a GB2 which will let you Counter Blast 1 and G blast (only if you have an Altmile heart) to give him two skills. 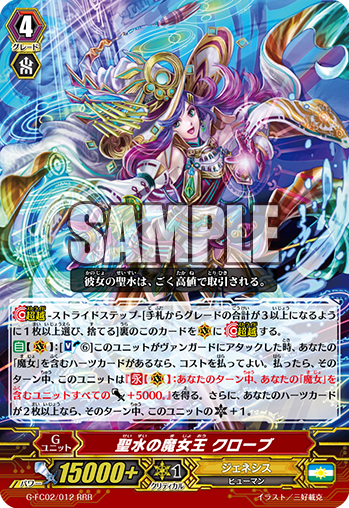 The first skill activates when Altmile attacks a Vanguard which will let you search your deck for a Grade 2 and bring it to the field with +5000 power. This is a nice bonus if you attack first with your rear-guards, allowing you to get in an extra attack. His second skill gives the whole front row +2000 power for each face-up copy of Aerial Divine Knight, Altmile (The previous Altmile stride unit) in your G zone. 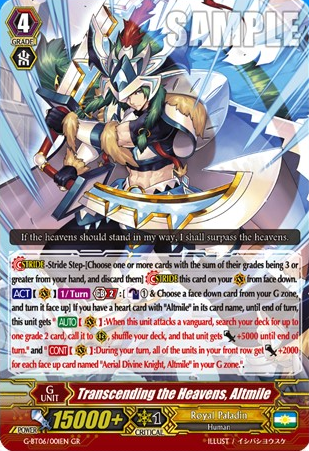 This can go up to a buff of +8k to the front row and combine that with the Grade 3 Altmile’s on-stride skill of giving +5000 power to two units as well as this Altmile’s superior call with +5000 power and you’re going to have a seriously powerful turn. Another superior caller comes in the form of an 8k Grade 2 named Hopesong Angel. 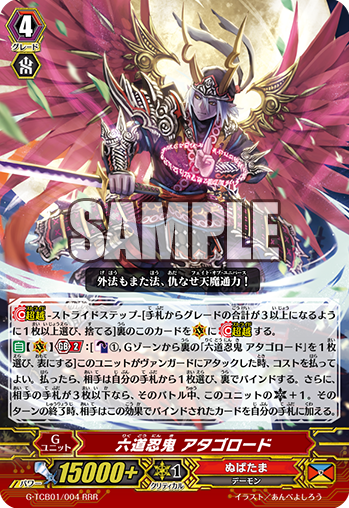 Much like Starlight Violinist and Benizel has you SB1 and CB1 for a superior call one, though unlike the two previously mentioned cards Hopesong Angel isn’t restricted to Grade 2 searching, instead he searches your deck for a card with Brave and calls it to rear-guard circle. Another plus this has over Benizel is it isn’t GB restricted, allowing you to use this early game to set up your Brave-filled field. As for the actual Brave units we have three new High Beasts with the keyword. Firstly the defensive unit with Brave, Scouting Owl, a Grade 1 who acts as a 10k shield if you SB1 and move him from a rear-guard circle to the guardian circle. A great way to fight back in a defensive manner when you’re being pushed too far by your opponent’s attacks. The second Brave unit, Shyngal, is a more offensive one with the Brave. This Grade 2 is given +2000 power and if he hits a Vanguard you can Counter Blast 1 to draw a card. 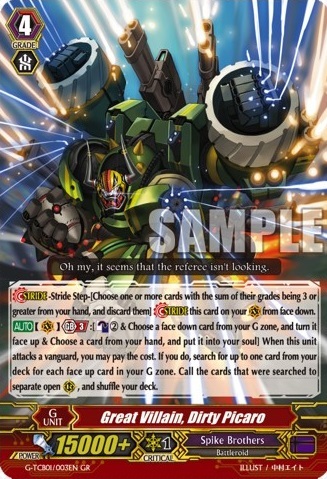 Similarly the stand trigger Salgal allows you to draw a card while in brave only this time it’s when he is placed on Vanguard circle and at the end of turn you have shuffled him back into your deck. The great thing with Shyngal and Salgal is that you draw the cards in your end phase so it does not interfere with any of your other Brave skills and with the new stride stands seem a lot more useful in Royal Paladin builds. Nova Grappler finally get their Glimmer Breath clone with Extreme Battler, Abarail. With a GB1, if your Vanguard is Victor, and when this unit is placed on a rear-guard circle, you may SB1 and CB1 to give Abarail +2000 power and when he attacks a Vanguard choose one of your rear-guards and stand it with an extra +5000 power. This is a great effect allowing for two powerful attacks though Cool Hank is especially great for using in Rush decks. Moving down the Grades we have the Perfect Guard, Extreme Battler, Gachibattle. When Gachibattle is placed on the guardian circle he gives the usual skill of dropping one to nullify attack as well, if you are on GB1 and you have another copy in the drop zone then can choose one of your rear-guards and it’s given a skill to Counter Blast 1 and at the beginning of one of your guard steps on that turn you can bring that chosen unit to the guardian circle with +10000 shield. Next in the Extreme Battler series get a new forerunner with GB1. Extreme Battler, Cabtron can put himself into the soul and by Counter Blasting 1 at the end of the battle that this unit boosted to stand one of your rear-guards and give it +2000 power. This is a nice and easy way to get those Rush abilities activated. Extreme Battler, Runbhol may still be a choice for many people though due to Cabtron eating away at the Counter Blasts when you could be using them on things like Cool Hank and Abarail. Speaking of Runbhol there is a very similar Grade 1 option, Ratchadamnoen Kid. Ratchadamnoen only stands back up once a card with Rush has been stood up in the same column. Due to this Rush restriction it allows Ratchadamnoen to have a 7k base but not having a GB1 does wonders for this card and is sure to be used in nearly all Rush decks. Raizer get some more support with a new legion with the leader being Ultimate Raizer Glory-hand. Now Glory-hand can legion with either the old unit Ultimate Raizer Dual-flare or the new unit Ultimate Raizer Speed-star. If another of your Raizers stands from an effect of one of your units and if Glory-hand is in Legion then that stood unit gets +5000 power. He has the power but does not have an ability to stand units himself but that’s where his mate comes in. 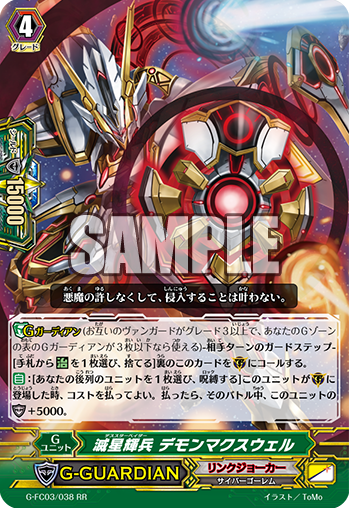 While on the rear-guard circle and your vanguard is in legion Speed-star can Soul Blast 1 Raizer to gain +3000 power and if his attack hits a Vanguard you can stand another unit and Glory-hand will give that unit +5000 power. Shinobiraizer‘s skill activates when another of your Raizers in the same column stands due to an effect. He allows you the chance to look at the top three cards of your deck and if you do you and all the shown cards are all Raizers you can put one of the cards into your hand and put the other two in the drop zone, however, if one or more of the revealed cards isn’t a Raizer then they all go into the drop zone. This skill is a good way to have a choice in what you draw while also giving you fodder to legion with seeing as the amount of Raizer legions are slowly building. Finally for Raizers we have a forerunner, Turboraizer Custom. As an ACT you can CB1 and retire Turboraizer Custom to give one of your units the ability to stand after they have attacked with an added +5000 power. This is another way to fill your drop zone in preparation for legion-ing and the skill itself helps out Glory-hand, giving the stood units +10000 power. Lastly for Novas we have the triggers. 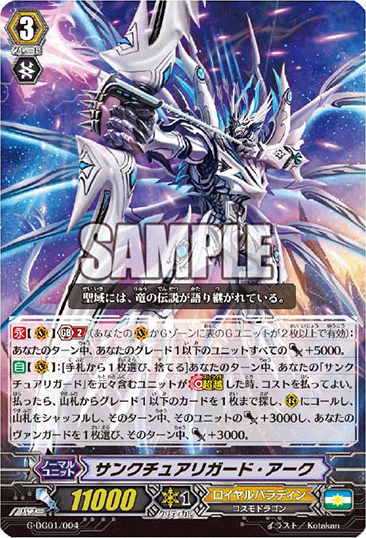 Extreme Battler, Buchinurk is the critical trigger who is the Heart Thump Worker clone who goes into the soul when you Victor Vanguard attacks to give it +5000 power and draws you an extra card. A stand trigger under the name of Beast Deity, Great Eater can go back into the deck when one of your units stands from an effect, and if it does you can draw a card. 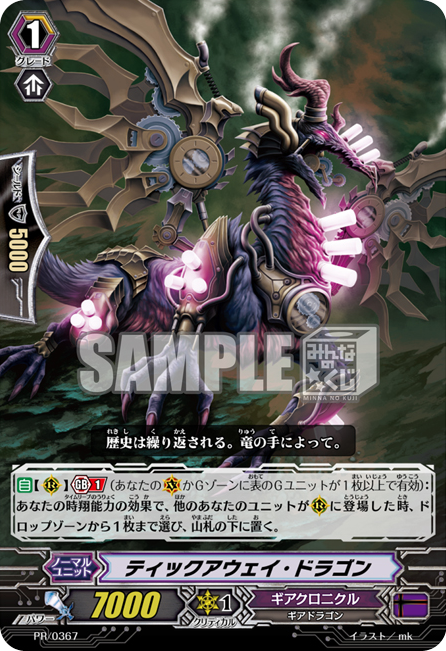 The stand trigger Perfect Referee 2.99 gives another unit the Rush keyword to give it +5000 power when it attacks a Vanguard after restanding. Other than that we also have a vanilla heal trigger, Training Therapist, and a vanilla draw trigger, Totem Brothers. A great little Maiden of card for Neo Nectar has made an appearance with the addition of Maiden of Rambler. When you are paying the cost of striding she counts as a Grade 2 and when she hits the drop zone from playing the stride cost then you can call her to a rear-guard circle and draw a card. This is interesting in the way that it encourages you to you more than just one card to stride also lowering the pressure of thinking you need a Grade 3 to drop to stride effectively. She only gets these abilities if you have a Maiden of Vanguard but they are getting pretty powerful lately and even have their own legion and stride. Maiden of Noisette is a new forerunner for the sub-clan with an ability to CB1 with Maiden of in the name and putting Noisette into the soul to give two of your Maiden of units the ability to draw a card if their attacks hit and if you have two units on your Vanguard circle with Maiden of in the name. To help you get your Maiden of Rambling Rose and Maiden of Trailing Rose for the legion skills there is Maiden of Damascena. When Damascena’s attack hits a Vanguard you can Counter Blast a card with Maiden of in the name to search your deck for a Grade 3 Maiden of and put it into your hand. Not having a GB makes me love this card because it makes the deck a lot more consistent and works well early and late game. 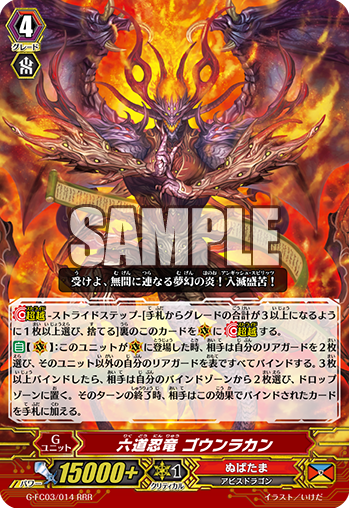 Red Leaf Dragon is an interested Grade 3 allowing you to have up to sixteen of it in your main deck and at the beginning of the main phase, either on the Vanguard circle or rear-guard circle, you can Counter Blast 1 to search for another copy of him and place it on rear-guard circle and the unit you CB’d with gets +1000 for each Red Leaf Dragon on the field until end of turn. This will work great for keeping a constantly cloned field and also having the option to have more than four eliminates the risk of too many falling into your damage zone. 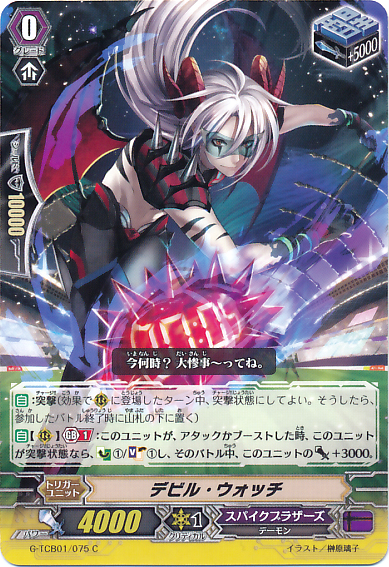 As well as Afoo Roccoli having one of the most ridiculous pieces of artwork in Vanguard this Grade 1 also has a pretty decent skill. With a GB1 and when an attack hits in the battle that he boosted you may retire him to choose one of your units and superior call another copy from the deck. Yet again this just helps Neos get the constancy they need though finding space for this guy is going to be a little tricky. As for some Bloom support we have Crop Maker Dragon. 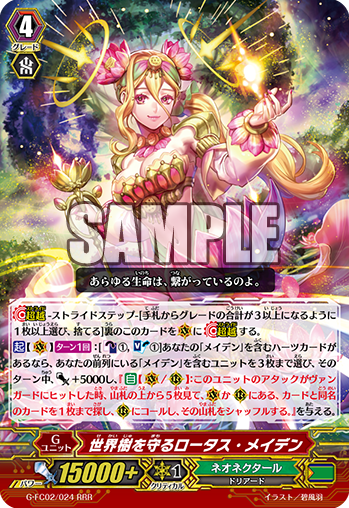 When Crop Maker is placed on a rear-guard circle you may CB1 to retire a unit with the Bloom ability to search your deck for up to two copies of that card and place them on the rear-guard circle and they gain +3000 power. It gets a bit awkward with Crop Maker being a Grade 2 by it being limited to what you can clone if you want to make full use of his skill but by bringing out Greenshot Elf you can turn her into a booster and she will even gain extra power through Bloom. 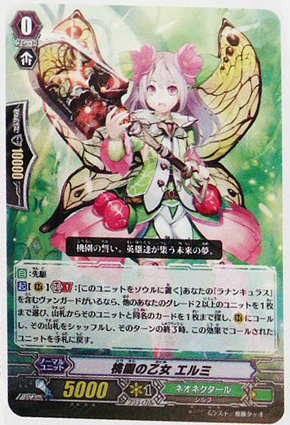 Finally for Neo we have Tomboy Elf who continues the Bloom support by putting a normal unit from your drop zone into your deck, allowing you to give a unit with the Bloom keyword a buff of +2000 power for each card on the field with the same name. Onto the Granblue support and we have a new Grade 3, Ghoul Dragon, Gast Dragon. Gast Dragon has Hollow and a GB skill that allows you to mill two card from the top of your deck when he attacks a Vanguard and he gains +3000 power AND if he is Hollowed then he gains an extra +5000 power. Now you may be thinking that you would prefer to use him as payment for stride… why not do both? He has another skill to choose one of your Grade 2 or higher rear-guards and retire them and CB1 to call this card to a rear-guard circle, allowing you to make use of his Hollow keyword several times in a game. Another Grade 3 Granblue that has been revealed is Sleepless Ship’s Captain, Blackgeek. When Blackgeek is placed on the Vanguard circle you may CB1 and SB1 to choose a Grade 2 from your drop zone and bring it onto the field and as an ACT once per turn you can CB1 to call a card from your drop zone and give it +5000 power and at the end of the turn retire that unit. The Grade 3s don’t stop there as we have some support for the Seven Seas subclan with Seven Seas Dragon Undead, Prisoner Dragon. Similar to Gast Dragon, this unit can CB1 and retire a Grade 2 or higher to call himself though this time it is when your Seven Seas Vanguard has attacked, allowing for some extra attacks by attacking with your rear-guards and then replacing them for this fella. Dragon Undead also gains +2000 power when brought out onto the field from the drop zone so he is able to penetrate crossride levels of defence. As for Grade 2 Seven Seas support we will be getting Seven Seas Witch Doctor, Raceruler. When Raceruler is placed on a rear-guard circle and if you have a Seven Seas Vanguard you may CB1 to call a unit from your drop zone and that unit gains +5000 power until end of turn. At the end of the turn you must retire that card but it leads to some powerful early plays. Seven Seas Apprentice, Nightrunner is a new forerunner who’s skill works from the drop zone. At the beginning of your main phase you may mill four cards from the top of your deck to call this card to a rear-guard circle. Unfortunately you have to retire him at the end of the turn but it at least fills your drop zone up a bit. Grenache has shown to be everyone’s favourite Granblue forerunner at the moment but Nightrunner may see some action with future Granblue releases. If you thought Disappear-running Zombie was great then you’re going to love Ghostie Great King, Obadaia. When Obadaia hits the Vanguard circle you search your deck for three cards and put them into the drop zone. This sorts out the randomness of milling from the top of the deck but it doesn’t stop there. If two or more of the cards you put into the drop zone had the Hollow keyword then you can choose a Ghostie normal unit from your drop zone and place it onto the rear-guard circle. Not only does this guy have amazing art but he also has an amazing skill! And for the final clan we have Shadow Paladin. I’ll start with their new Grade 3, Death Spray Dragon. Death Spray has a GB1 skill that activates at the end of his battle if you CB1 and retire one of your units and has you retiring one of your opponent’s rear-guards. This guy does work on the rear-guard circle but generally because of the high cost he may not be used in battle much. A card that will be seen a lot though is Cradle Knight, Oscar who is here to directly support Claret Sword. If you have a Claret Sword Vanguard and are at GB1 you can put Oscar into the soul to search your deck for a Grade 1 and shuffle your deck then put the Grade 1 on top of your deck and Counter Charge 1. Some may still be wanting to keep David but after I tell you about this new stand trigger you may think differently. Demon Eye Mage, Alsur is a new stand trigger and he is truly something. When he would be retired he gets David’s skill of counting as two units and when he is put into the drop zone you can put him into the deck and shuffle. This is an amazing card for Shadows and will make many want to use stand triggers in many different Shadow decks. For Revengers we have Vigor Revenger, Maul. When Maul is placed on a rear-guard circle and you have a Grade 3 or greater Revenger then you may CB1 Revenger to put a card from your deck into your hand with the same name as a card on your Vanguard circle. This will mostly be used for Raging Form Dragon for his Persona Blast skill to ride another copy of himself after attacking. After that there are nothing more than some vanilla triggers for Shadows, those triggers being Grave Horn Unicorn a critical trigger, Ingenius Strategist, Ophir a draw trigger, and Illegal Alchemist a heal trigger. Well that is finally everything for G-BT06. It is definitely an interesting and diverse booster with so many different sub-clans and different builds in general getting supported. I am personally looking forward to this set. Be sure to check in next week when I’m sure there will be more Legend Deck cards revealed. Welcome again to the weekly Vanguard update. We finished off all the Technical Booster cards last week so now it’s time to look deeper into the future with the next booster set, G Booster 6 Transcension of Blade and Blossom. Neo Nectar are the first up with their new Grade 3, Centaurea Flower Maiden, Ihnes. This lady shows us once again the power of Bloom with her ability allowing you to get some extra shield in preparation for your opponent’s next turn. When Inhes’ Bloom is triggered (By having another copy of her landing on a rear-guard circle) it gives all the other copies of her the ability to go to the bottom of the deck then look at the top five cards for one with Bloom and put it into your hand. Now if you want the Bloom cards in your hand a little earlier then you also get a chance to get one when you ride her; When she hits the Vanguard circle you can CB1 and SB1 to look at the top five again and search for a Bloom to put in your hand. Ihnes is a really good support Grade 3 for Ahsha and even has potential to be the main boss in a lower budget Neo Nectar deck. Though maybe people will just want her for her beautiful artwork. Neos also get a nice perfect guard. Remember all the Technical bros getting the G perfect guard and the special G perfect guard with the extra abilities? Well it seems that’s going to be a thing with all clans now. Neo Nectar get Cherry Blossom Blizzard Maiden, Lilga who has the Bloom keyword, making her a great target for Ihnes to put to the hand. Lilga’s Bloom costs a CB1 but with that it allows you to put all of the cards with the same name into the hand. This gives you a nice opportunity to use Lilga offensively until something better comes along and then pop her back in the hand for a quick defend. This works so well with Ihnes that you could easily of had all your perfect guards in your hand at some point. 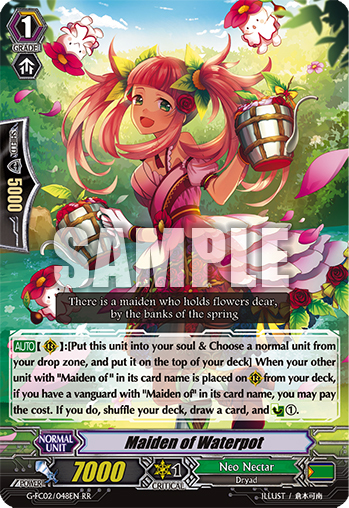 If you quickly swap your Vanguard to Ahsha and are using Early-flowering Maiden, Pia that will allow you to put the perfect guards back into your deck, allowing for more perfect guard searching! We have a similar card to Ihnes for Royal Paladin with Model Knight, Orhan. Similar to Ihnes, when he is placed on the Vanguard circle you can CB1 and SB1 to search your top five cards for a card with Brave and put it into your hand. His other ability is very different to Ihnes’s though. With a GB1 and if his Brave is active (Meaning you need to have three or less cards in your hand for it to be active) he gives the whole front row +3000 power which may not seem like much but that is even in your opponent’s turn so the more he’s attacked the harder it will be to hit him. This will work great against Aqua Force with their continuous yet weak attacks. As well as Ihnes I feel you can make a budget deck with Orhan as your boss if you were looking for a more defensive Royal Paladin deck. If you are going for the Altmile build though then you might want Counterattack Knight, Slayman. This trusty Grade 2 has a GB1 skill that allows you to CB1 and drop a card from hand when attacking to search your deck for a Grade 2 and bring it onto the field with an extra +2000 power. He doesn’t eat up the soul like Benizel and doesn’t need to be boosted like Knight of Twin Sword but he does need Altmile as the Vanguard and dropping a card for it may seem questionable, but wait! His skills don’t end there. He also has the GB1 Brave ability that gives him an extra +3000 power as long as Altmile is your Vanguard and like Orhan’s skill it even works on your opponent’s turn, which will annoy your opponent when they thought the only unit they would be able to hit is your 9k rear-guard. They’ll be dreading Slayman by the end of the game. 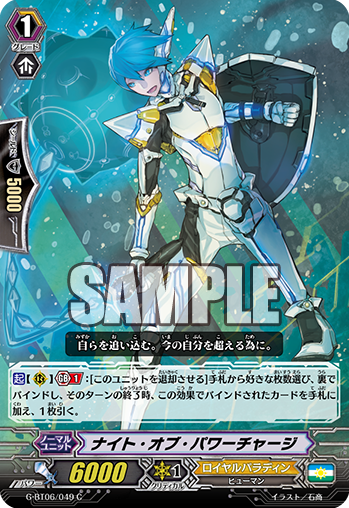 “But Brave is such an awkward condition to meet” I hear you screaming, well luckily there is a solution for this, meet your new favourite G Royal Paladin! Knight of Power Charge! His 6000 power may put a few people off but you can retire him through an ACT to choose any amount of cards in your hand and put them into the bind zone face down. Retiring him and not being able to easily superior call him is a bit of a bother but if you have ten cards in your hand and you want to activate your Brave skills then he’ll be your best friend. Rush is a new keyword given to the Nova Grapplers, a clan we haven’t seen for a while. Rush activates once the unit restands due to an effect of a different card. The first card to show off this keyword is the Grade 1, Kumah the Destroyer. When Kumah’s Rush is active he gains +5000 power so he doesn’t have a super-mega-ultra crazy skill but with the other G Novas already giving around 5000 power then he can get extremely strong with standing him up a lot in battle. To accompany him is the Grade 2, Master Kungfu. Master Kungfu has an on-hit Rush skill which gives you the option to CB1 when his attack hits to stand up another unit and give it +5000 power. You might want to target another Master Kungfu with this to keep an onslaught of attacks coming your opponent’s way or give it to Kumah for a +10000 boost of power. Pale Moon are getting a new stride by the name of One Who Tells the Demise, Mephisto. If you flip faceup another G unit (Editor’s Note – G-Blast!) then all your units gain +1000 power for each faceup card in your G zone called One Who Tells the Demise, Mephisto. Then for every two faceup cards in your G zone you can call one unit onto a rear-guard circle and give it +5000 power and at the end of the turn it goes back into the soul. Mephisto is an extremely strong finisher with bringing out new units with the potential of having an extra +8000 power as well as Intensely Spicy Clown getting more more power for each unit brought out plus Intensely Sweet Clown who gains another +5000 when brought out from the soul. Acrobat Bear will help you with getting the cards you need into the soul. With a vaguely Gold Paladin-y skill, this little Grade 1 has you search the top three cards of your deck when placed on the rear-guard circle. The search is to put any one of the three cards into your soul and put the rest to the bottom of your deck. He does need a GB1 so he won’t be used in every deck but he is good at what he does. Crescent Moon Juggler is a Glimmer Breath clone that allows you to Magia one card and give that unit and Moon Juggler +2000 power until the end of turn. Like all Glimmer Breath clones it costs a CB1 and SB1 with a GB1. Luckily you can use him multiple times if you were to use other cards to Magia him out of the soul. Lastly for G-BT04 we have the Granblue card Disappear-running Zombie. When he’s placed on a read-guard circle, with a GB1 and if he’s Hollow, then you can search your deck for a card and put it into the drop zone. If he is not Hollow then you just take the top card of your deck and put it in the drop zone. This is such a good ability for Granblue, being able to be so precise with what you are putting into the drop zone. That isn’t the end of Granblue as a whole for this week though. A couple of trial deck cards appeared, Witch Doctor of the Corrosion Sea, Negrorook and Underling Pirate Skeleton, who are a Grade 2 and 1 with the same ability. These two get +2000 power when there is a GB1 and if they are Hollowed they gain another +5000 power, making them much stronger than the average clan’s version of them. As an additional note, Daigo will be getting a new set giving more support to the Sanctuary Guard archetype. 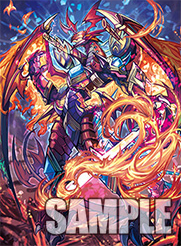 Sanctuary Guard Dragon and Sanctuary Guard Regalie will be getting reprints as well as Sanctuary Guard Arc finally becoming a card (Previously only shown in the anime). There will also be a new arrival with Sanctuary Guard Imperial who is a new stride for the archetype. That’s all for this week. Be sure to check in next week for more G-BT05 cards and hopefully some Legend Deck cards! Welcome again to the weekly Vanguard update. The last of the Technical Booster cards have been revealed as well as some cards for G-BT05 with a nice show of the new Granblue units. Let’s finish this Technical Booster off then, shall we! If you were worried that to get power boosts in the new Spike Brothers you’d have to be charging then you would be wrong. Spike Brothers get the generic (but useful) 12k Grade 2 on their side and all you need is a Generation Break 1. With Moodmaker Nyanrook boosting this card you can get the column up to 23k that turn. Having Nyanrook go to the bottom of the deck can also make a non-boosted Genie a 16k attacker! Hive Maker is a new Grade 3 for Spike Brothers with a charge ability that allows you to CB1 when he goes back into the deck to choose a card from your hand and bring it onto the field, thus activating that new card’s Charge. However, when Hive Maker is placed onto the Vanguard circle you can CB1 and SB1 to look at the top five cards of your deck and put one card with Charge into your hand. The first ability is where this card truly shines, allowing for additional attacks and additional Charges. I feel this will see a lot of play as a backup Grade 3 in SB decks. If you needed some Counter Charging and Soul Charging then this little trigger has you covered. Devil Watch is a Stand Trigger with Charge that gives him +3000 power when boosting OR attacking and allows you to Counter Charge and Soul Charge 1. This will really help with keeping up your resources with the kinda big downside of it being a Stand Trigger. Although the fact the Bushiroad are trying to give Stands some love is good, Stands aren’t the best with Spike Brothers due to things going back into the deck after attacking. Still, I’m sure a fair few people will give this card a try and hopefully it works out for them. We also are getting two more vanilla triggers, Magical Manager the Heal Trigger and Mecha Advisor the Draw Trigger. Lastly for Spike Brothers there are two forerunners. The first one is Psychic Mel with the generic ability to CB1 and search the top five cards for a Grade 3 and put it into your hand. This will work well for Bad End Dragger to ensure that you can Break Ride and maybe to have more Bad Ends in your hand so you can keep on Break Riding turn after turn. Mecha Analyzer is the second forerunner that helps out a bit more with the G decks. With a GB1 and when a rear-guard is put into the deck you can put Mecha Analyzer into your soul, if you do then you can put one of your rear-guards into the bind zone and then put it onto a rear-guard circle and it gets +3000 power. This is great, allowing to essentially stand your rear-guard back up, rearrange it on the field, and put it into charge with an additional 3k on top. I’m sure this card will see heavy play in Rising decks. Raging Strength Equipment, Hammer Gewalt is a new G unit for Tachikaze. When Hammer Gewalt is Engorged he gains +3000 power and if you Engorged on two units then you can retire a card in your opponent’s front row. This may seem like a big cost but if you stride over Gaiaemperor then you can get those two units back with just a CB1. Ancient Dragons get more support in this set. The first one I’ll talk about is the Grade 2 Ancient Dragon, Hypnohang that can stand up after attacking and giving +3000 power if you have a Vanguard with Spino in its name and you retire a rear-guard at the end of the battle that Hypnohang attacked. There are currently only two Grade 3s with Spino in their name and they are Ancient Dragon, Spinodriver and Ancient Dragon, Spinocommando. With Spinocommando bringing back the Spinos in this set hopefully we will see them in competative play. Unfortunately you can’t keep on using Hypnohang’s ability to stand up though due to it being a once per turn effect. Ancient Dragon, Nodtank will help you get more of that sweet, sweet Counter Blasting. When Nodtank is put into the drop zone from a rear-guard circle you may Soul Blast 1 card with Ancient Dragon in its name to Counter Charge 1 and give another unit +4000 power. This helps so much with Tachikaze and I’m sure will be a staple in any Ancient Dragon deck. I’m sure people have been wanting something like this for a very long time but better late than never! Lastly for Ancient Dragons there is a new forerunner Tiffany clone. Ancient Dragon, Babybird gives +3000 power to two of your Ancient Dragons when he is put into the drop zone. Whether people will be using this or Babyrex will all depend on how badly you need the face-up damage for later game but Babyrex definitely gives you better early game. Tank Mammoth only has 8k attack but if he’s retired and you CB1 and SB1 you can bring him back onto the field and give him +3000 power. Having to CB1 and SB1 may seem like a bit of a heavy cost and may have people struggling to find room in their deck for him but he’s great for consistency with the high retiring abilities and could be great with Gluttony Dogma. Tachikaze also get a 12k Grade 2. Accel Tiger Will help in some decks and may be chosen over Tank Mammoth just for the more consistant skill but with a GB1 you will only be getting it late game where as Tank Mammoth has the potential to give some early game pressure. Sheer Magnum is a new Stand Trigger that can go back into the deck when it’s retired and gives +5000 power to a unit as well as letting you draw a card. I have to say this is probably one of the most useful Stand Triggers yet, for Tachikaze to have this as retire fodder and getting additional power from it helps them so much. Yet again, Stands aren’t the best for this clan but with the ability it really shows that it has potential and will hopefully lead people to use it in their decks. Closing off on the Tachis we have the last two Savages. We have a very hungry lady named Savage Heroine who has the Engorge ability and for every unit she retires she then gets +3000 power when she attacks. She’s a 6k Grade 1 so chances are you won’t be using her very often but she could be good for a final attack. Plus it’s fun to think of her eating four cyborg dinosaurs in a matter of seconds. The last Savage is Savage Healer, just a vanilla Heal Trigger with a cute girl looking non-savage. Now for the last lot of the Technical Booster gang, the Nubatama ninjas. Starting off with a Grade 3 named Stealth Beast, Hagurejishi. Hagurjishi is a good backup Grade 3 with Afterimage allowing you to attack and then putting him back into the hand if you want to stride next turn. He also gains +4000 power for each unit placed on rear-guard circle that turn. This skill works but as a Vanguard and rear-guard allowing to rack up some serious power turn after turn. 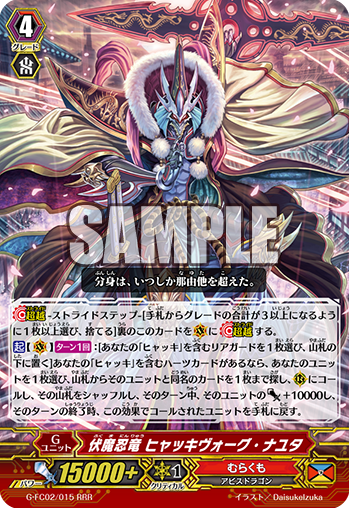 Stealth Dragon, Kegareshinmyo is another Grade 3 for Nubas who also has Afterimage. When he’s placed on a rear-guard you can give another unit +3000 power. Kegareshinmyo also has a similar ability to Hive Maker for when he’s placed on the Vanguard you can CB1 and SB1 to look at the top five cards of your deck and put one card with Afterimage from them into your hand. Like the other two, Nubatama also get their 12k attacker. Stealth Beast, Kibamaru unfortunately is one of the weakest out of the three due to the clan he’s a part of. He may still find play just for the consistent power. Stealth Rogue of Night Fog, Miyabi is the Amber clone of the Nubas. As Amber clones go, with a GB1 and when she’s boosted you can CB1 to give her +3000 power and if you have less cards in your hand than your opponent then you bind an opponent’s card from their hand and it’s put back into their hand at the end of the turn. Letting you bind a random card from their hand is very risky but has the chance to deny them a 10k shield or maybe even a perfect guard, giving you a great offensive advantage. Stealth Beast, Karasudoji is a new forerunner with the same skill as Psychic Mel to allow you to put it into the soul, Counter Blast 1, and look at the top five cards for a Grade 3 and put it into your hand. Nubatama also get three vanilla Triggers. 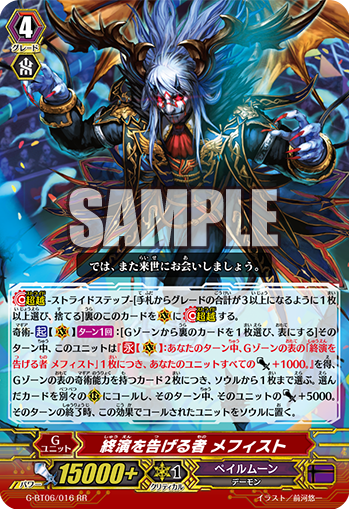 Living Method Stealth Rogue, Shigure the Heal Trigger, Stealth Fiend, Warashibehime the Draw Trigger, and Stealth Rogue of Piercing Death, Samidare the Critical Trigger. Onto the non-Technical Booster cards I will go through the new Granblue units which are very exciting. With another Amber clone we have Pirate Swordsman, Colombard who is extremely useful for the clan. When Colombard attacks and is boosted, with a GB1 and CB1, you can superior call any card from drop zone. With cards like Ruin Shade you can fill your drop zone with a great amount of different cards. Granblue’s new Grade 3 also shows the effects of the new Hollow keyword. When a card is placed on a rear-guard circle you can choose for it to become Hollowed, if you do you retire it at the end of the turn, becoming Hallowed allows you to activate all sorts of special abilities. The Grade 3 Mighty Rogue, Nightstorm has the Hollow keyword and at the end of the turn that he attacks when he is Hollowed you can CB1 to choose a card from your drop zone with a different name to him and call it to a separate rear-guard circle. He also has the Hive Maker skill for when he’s placed on the Vanguard circle to CB1 and SB1 and look at the top five cards of your deck and put a Hollow from among them into your hand. I’m sure Nightstorm will make a great backup Grade 3 for a lot of Granblue decks with being able to use the drop zone so well. 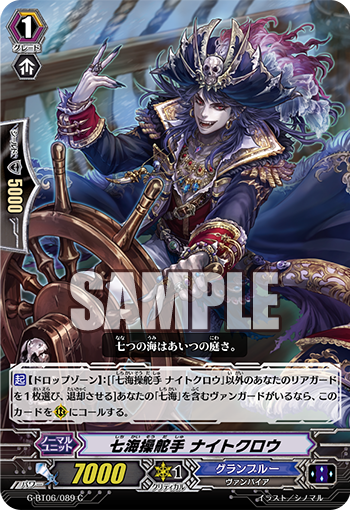 For a consistent booster we have Seven Seas Helmsman, Nightcrow. 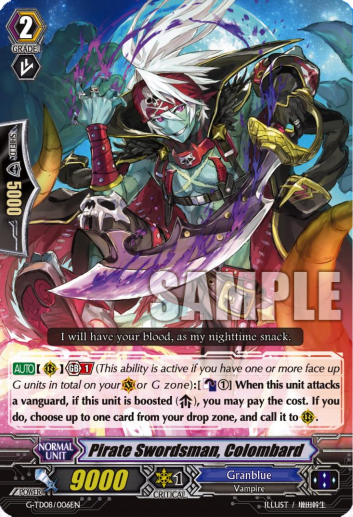 You may retire a rear-guard from your field if you have a Vanguard with Seven Seas in its name to replace the retired card with this 7k Grade 1. Combining this with Hades Steersman will allow you to bring out the Steersman when you hit Grade 3 and quickly replace it with Nightcrow for a much bigger boost. I think this card is great, whenever they had something like this before they’ve always had really low power but this having the usual power of a Grade 1 really helps. Beast Deity, Horned Hulk is there to support the Beast Deities of G-BT05. You can SB1 a card with Beast Deity in its name and rest Horned Hulk to give another Beast Deity +5000 power. This helps a tremendous amount with Deadliest Beast Deity, Ethics Buster Reverse by allowing you to rest and give power then lock those rested units so you’re not missing out as much on the rear-guard power. Revenger, Dark Breath Angel is bringing back the on-retire abilities for Shadow Paladin. When she is retired due to an effect of one of your cards and you have a Grade 3 or greater Vanguard with Revenger in its name then you can CB1 to superior call a Grade 1 from the deck and put it onto the field. This is similar to Darkpride Dragon but Revenger specific which really helps with Revenger, Phantom Blaster “Abyss” and would allow you to stand him up twice in one turn. For Neo Nectar we have the new Bloom effect shown. A card goes into Bloom if another card with the same name is placed on a rear-guard circle. Green Shot Elf has the Bloom effect and when she goes into Bloom with a GB1 you can choose up to five units named Green Shot Elf and they get +2000 power and the ability to boost. This should be a great power up over the field with each of the already placed Green Shot Elves giving power and having cards that can gain its name. Lastly we have a Spike Brothers promo, Devildam Chemist. He’s an early Grade 2 12k with not needing a GB1 but only has 6k power with the ability to SB1 and double his power. This is a nice early aggression but using up the soul like that can be a bit of a double-edged sword. That’s all for this week. We’ve gone through a lot of cards in such a short amount but the Technical Booster is finally completely revealed. I’m sure next week we’ll be seeing a load of new G-BT05 and G-LD02 cards so make sure to come back for next week’s article! Welcome once again to the weekly Vanguard update. Once again more Technical Booster cards have been spoiled along with an announcement for the next Legend deck. The clan who’s had the most love this week is Nubatama. Like Spike Brothers, Nubatama also get two perfect guards, Stealth Rogue of Veils, Kurenai who is the standard Counter Charger and Stealth Beast, Aramatatabi who doesn’t get to Counter Charge but gets additional skills. Aramatatabi has the Afterimage keyword so she can go back into your hand at the end of turn if your opponent puts a bound card into their hand and you have six or less cards in your hand. As well as that she can also allow you to Soul Blast 1 with a GB1, when you have another copy of her in the drop zone, and when she boosts to force your opponent to retire a card in their bind zone. People may struggle to decide which PG to use but I think it all depends how badly you need those Counter Blasts, if you have a heavy Counter Blast deck then it may be best to go with Kurenai but Aramatatabi is definitely a strong unit that you’ll want to use if you have the chance. 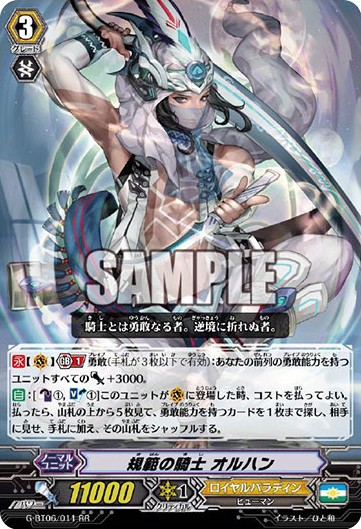 There is also a new forerunner named Stealth Rogue of Cold Wintry Wind, Kamojigusa though full details of this card are unknown. All we know so far is that it has afterimage and the chance to retire a card in your opponent’s bind zone. Lastly we have the RRR stride for Nubas, Rikudo Stealth Rogue, Atagolord. When Atagolord attacks, with a GB2, CB1, and G Persona Blast your opponent binds a card from their hand and if the number of cards in their hand is three or less he gains a crit. This is a pretty simple skill compared to a lot of the other Nubas but it is useful, the pressure will definitely help for late when you bring out Rikudo Stealth Dragon, Tsukumorakan. Tachikaze also got their special PG with Barrier Dragon, Styracolord. Unfortunately the whole skill hasn’t been revealed though it seems to have the engorge keyword and when it becomes engorged it gains +5000 power it goes back into your hand, making it a highly defensive and offensive unit. I think Styracolord is the best one out of the three with the sheer power it brings and retiring your own units isn’t a big deal for Tachis because there’s a good chance you’ll just get that unit back onto the field anyway. The GR for Spike Brothers is the very deadly Great Villain, Dirty Picaro. Picaro can be very strong though it’s probably best not to rely completely on him. When he attacks you can CB2, flip any face-down G unit face-up, and put a card from your hand into your soul to search your deck for card(s) up to the same amount of face-up cards in your G-zone and call them to the field. Giving you the possibility to refresh your whole field mid-battle phase with any cards in your deck is an astonishing ability. It would also allow you to have a whole field of charging rear-guards, though that would leave you with an empty field at the end of it. The biggest problem Picaro has is that he can only be used effectively late game and a CB2 with Spike Brothers is going to be harder to pull off with their heavy Counter Blasting. He is still a solid unit though and a great back-up if everything goes wrong. I would suggest every Spike Brothers deck should have at least one of this if you can get a hold of one. Frog Raider is a new Grade 1 to help “Rising“. He has a GB1 and when a unit with the charge ability is placed in the same column as him allowing him to really help with the new Spike Brothers by standing up several times throughout the game to give constant boosts. A great card for Frog Raider is Heave Wheeze. When Heave Wheeze is charging he gains +10000 power. These two together can easily get to 26k and with Dirty Picaro you can easily bring out Coe Ho to both side columns allowing for some extremely strong attacks towards you opponent. 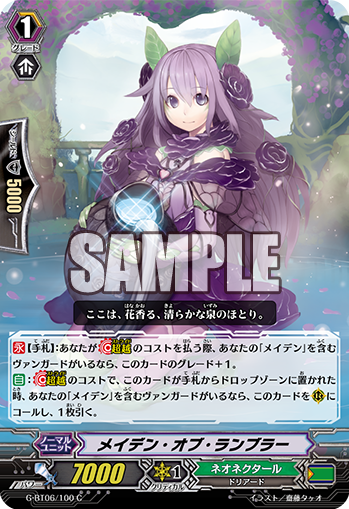 A few promos have been shown and Maiden of Sweet Berry for Neo Nectar is one of them. This little 6k Grade 1 has a GB1 ACT that allows you to choose one of your rear-guards and clone it with no Counter Blasts or Soul Blasts. Once you have cloned the rear-guard you have to put Sweet Berry into your deck and shuffle. This is a useful backup but not necessary, two of this card may be enough in most Neo Nectar decks. Chrono Dran will be getting a reprint as a promo with a golden hot stamp. 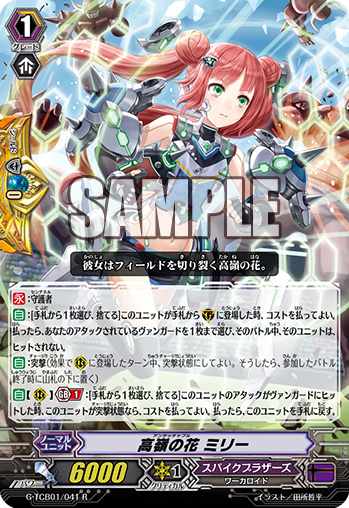 Another hot-stamped promo is Knight of Early Morning, Koel the Gold Paladin Grade 0. His skill has yet to be revealed but I feel he will be a forerunner who works well alongside Gurguit due to the title of Koel. Well… the second Legend Deck has finally been revealed. Last time we had Ren Suzugamori’s Shadow Paladins… but this time… it’s Kagero’s time to shine! Ol’ Dragonic Overlord is back as Dragonic Overlord “The Legend”. His and many other’s skills have yet to be revealed but we were also shown a few more familiar faces in their new forms of Lizard Hero, Undeux; Berserk Lord Dragon; Dragon Partner, Monica; and Armor of Flame Dragon, Bahr as well as the art of what looks like a new form of Nouvelle Vague as a stride. There is one card that has had his skill revealed though and that’s Emperor Dragon Knight, Nehalem. If you have a Vanguard with “Overlord” in the name then Nehalem gets +2000 power making him an 11k Grade 2, but when your Grade 4 Vanguard attacks then he gains another +5000 power. Using this with Dragonic Overlord “the Ace” can give Nehalem a boost of +12000 in total making him 21k on his own. We will hopefully be seeing more of this new Legend Deck in the near future, named G Legend Deck 2: The Overlord blaze “Toshiki Kai” in the Japanese version. If you miss your old Kagero buds you may want to pick one of these up and I’m sure it will be just as good, if not better, than the first Legend Deck. Welcome once again to the weekly Vanguard update. This week we get to see some Technical Booster fun along with a bunch of promos so be prepared for a lot of Technical goodness. I’ll start off with the newly shown R stride for Nubatama. 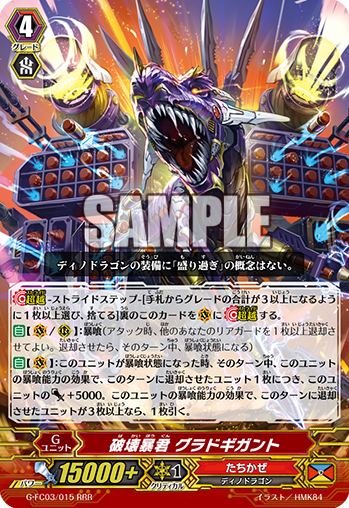 Rikudo Stealth Dragon, Zaramerakan seems to be a rather more complex version of Rikudo Stealth Dragon, Gedatsurakan that works more with the new Afterimage keyword. When Zaramerakan’s attack hits you choose one card from your opponent’s hand and bind it and if you have three or more rear-guards with the Afterimage keyword then your opponent chooses a card from their bind zone and retires it. Not being able to choose which card to retire is a bummer but it at least allows you to put a card in the bind zone beforehand which Gedatsurakan didn’t let you do. Gedatsurakan would still be best for older Nuba builds though Zaramerkan works great in the new G decks. Speaking of units with Afterimage, Stealth Rogue of the Mirror Moon, Tsubakuro is a new unit that specialises in defending though thanks to the Afterimage skill you can attack with him and then defend next turn. His skill is simple and with a GB1 that gives him +5000 shield making him a 10k guarder. The downside is that he’s a 6k Grade 1 so even when on the offence he won’t be doing much damage. With some Shiranui support we have the Heart Thump Worker clone, Stealth Dragon, Noroi. So as you may know with the Heart Thump Worker clones, when your G boss (In this case Shiranui) attacks you may put Noroi into your soul to draw a card and give Shiranui +5000 power. Along with this clone we also get the LB Enabler Stealth Beast, Kurosakazuki who can really help with the old bosses from BT13, Shura Stealth Dragon, Kujikiricongo and Shura Stealth Dragon, Kabukicongo. On to Tachikaze we have the Amber clone Blade Dragon, Jigsawsaurus. There is a slight difference compared to most Amber clones and that is as well as the GB1 and CB1 you also have to retire one of your own units, if you do you can also retire one of your opponent’s and this unit gets +5000 power, as well as that he also allows you to draw a card if his attack hits a Vanguard. Thanks to the new Grade 3 Emperor Dragon, Gaiaemperor you can easily get that retired card back onto the field, reactivating on-call abilities and allowing you to rearrange your field. You could combine Jigsawsaurus with the new Freeze Dragon, Freezernics who makes the best use of being retired. When he is retired, if you have a Gaia Vanguard, you can Counter Charge 1 and Soul Charge 1 and give another unit +2000 power. 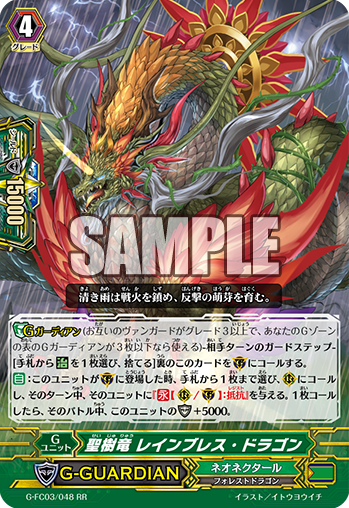 When Beam Dragon, Apatomaser is placed on rear-guard circle you may CB1 and SB1 if you have a Vanguard with Gaia in the name and Apatomaser gets +2000 and when he attacks, if he is engorged, he gets +5000 power and you draw an extra card. There seems to be a lot of drawing considering you can easily get these units back as soon as they’re put in the drop zone. This may eliminate any need for Draw triggers in G Tachikaze. Savage Guardian is the new G Perfect Guard. It’s nice to see the Savages again and the Counter Charge will really help Tachikaze. Along with the new Perfect Guard we also get the Heart Thump Worker clone Cannon Fire Dragon, Parasalauncher who works with Gaia. Spike Brothers have been shown to have two Perfect Guards, the standard G Perfect Guard, Kissmark, Alma and one without the Counter Charge but with additional skills, Untouchable, Milly. Milly has the charge ability to put into the hand from your rear-guard circle if her attack hits a Vanguard. This works great alongside the new Grade 3, Exceptional Expertise, Rising Nova, who will allow you to bring her out from the deck and give her +5000 power for an 11k attack without boost. When Axe Diver is placed on rear-guard you may CB1 and SB1 and when you have a Vanguard with Rising in the name you bind one of your own rear-guards and then call it back onto a rear-guard circle. This is great for getting your units to charge and if your unit is then charging it gets +5000 power until the end of turn. This can be superior called by units like Rising Nova in the middle of the battle phase to then essentially stand another unit back up and allow it to charge. The Heart Thump Worker clone for Spike Brothers is Liar Lip who helps out with your Rising Vanguard and the Limit Break Enabler is Cheer Girl, Elza which is a lot of help for Bad End Dragger. For promos there’s a big mix of things including a few much needed reprints. Whether these cards are going to be released in English or not is not yet known. The first new promo is Tickaway Dragon for Gear Chronicle. This is a very interesting Grade 1 that puts a card from your drop zone on the bottom of your deck when one of your other rear-guards in placed on the rear-guard circle due to a Time Leap effect. This will prevent you from decking out and allows you to put those all-important triggers and Perfect Guards back into your deck. Tachikaze get a very simple booster with Savage Foxy. When she boosts if you have less rear-guards than your opponent, she boosts for an extra 2000 power, making her a 9k booster. Along with this Nubatama also get a booster that is a 6k Grade 1 that gets +4000 power when boosting a Vanguard with a GB1. The last new promo is Chocolatier Ronne, a Bermuda Triangle Grade 1 who has a very Bermuda-y effect. When she is bounced back into the hand you can CB1 and SB1 to draw a card. For reprints we have many but they are all very wanted cards. For Pale Moon we have Purple Trapezist, for Dark Irregulars Flying Librarian, Link Joker get Dark Metal Chameleon, Libergal for Royal Paladin, Dandelion Musketeer, Mirkka will get her non-chibi form for Neo Nectar, and finally King Serpent for Granblue. That’s all for this weekly update of the Technical Booster and promo cards. Be sure to check back next week for the next one! Welcome back to the weekly Vanguard update! All the Fighter’s Collection cards are almost completely spoiled. We received some great spoils this week including some support I’m especially looking forward to! First we have the Neo Nectar stride for the “Maiden of” support. 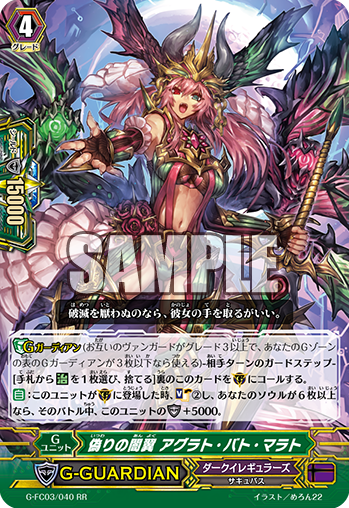 Yggdrasil Protection Maiden of Lotus is almost like a quicker version of Dream-spinning Ranunculus, Ahsha. If you have a heart with “Maiden of” in it’s name and with a Counter Blast and Soul Blast of 1 you can give up to three units with “Maiden of” in their name in the front row +5000 power. If their attacks hit a Vanguard then you search the top five cards of the deck for a card with the same name as a card on your Vanguard circle or rear-guard circle and call it to rear-guard. This works great for Maiden of Trailing Rose and Maiden of Rambling Rose with their goal of cloning themselves on the rear-guard circles, allowing for the easy power boost. It may be useful if you only have one Hollyhock Knight on the field to get a good chance of cloning him for your turns when you can’t stride. Next we have Omniscience Dragon, Cath Palug, the Great Nature stride supporting “Honorary Professor” (AKA Chatnoir). Whenever a rear-guard attacks and you have a heart with “Honorary Professor” in the name, you may CB1 to give one unit +4000 power. At the end of that turn draw a card and retire that unit. This stacks really nicely if you keep giving the power to one unit and being able to stand that unit back up to allow you to draw multiple cards for one retire. This is where Crayon Tiger will help you to stand other units and let you draw even more! The downside to this is that those Counter Blasts are going to rack up quickly, though luckily Great Nature are quite good at Counter Charging. Okay, it’s time for the cards I’m really looking forward to… Jewel Knight support! 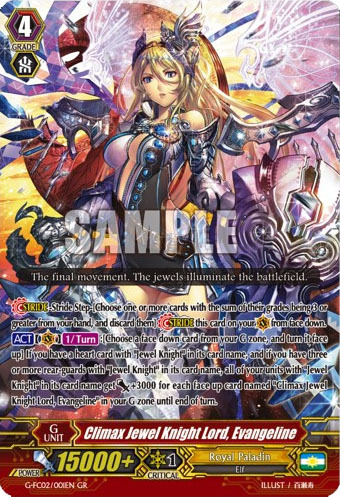 Climax Jewel Knight Lord, Evangeline does wonders for Jewel Knights by letting you turn any G unit face up if you have a Jewel Knight heart and giving every card with Jewel Knight in its name +3000 power for every face up Climax Jewel Knight Lord, Evangeline in the G zone. If you’re using a pure Jewel Knight deck like my own then you can easily see how the power of this will rack up. Many Jewel Knight cards allow you to superior call other units granting you the chance to easily have a powerful full field. With a drawn out game against a defensive deck you will be able to use this lady up to three times, first giving everything +3000, next +6000, and after that +9000 to all of your units! Making +18000 power columns! A Grade 1 for Jewel Knights was also revealed. Bringing Calling Jewel Knight, Christine onto the field when there are three or more other rear-guards with “Jewel Knight” in their name allows you to Counter Blast 1 and reveal a Grade 3 from your hand to search your deck for a Grade 3 Jewel Knight and call it to a rear-guard circle. At the end of the turn that you use this skill you put the newly called Grade 3 into your hand and then discard a card. You can use this to ensure you can continue to break ride with Pure Heart Jewel Knight, Ashlei or you may want to do it just to have something to use to stride next turn. With no Generation Break you can use this before you’ve even hit Grade 3 to guarantee you ride the card you want. With the new Aqua Force Clan Booster you may have been worried because Trans-core didn’t get a new card. Luckily the Fighter’s Collection come bearing merciful gifts. 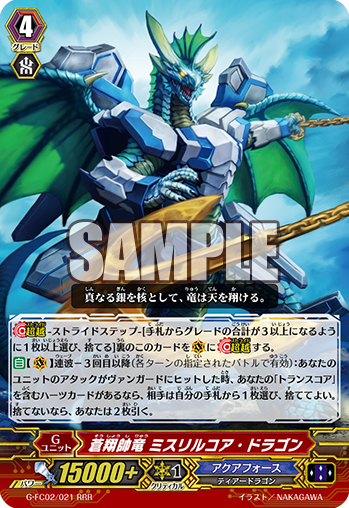 Blue Flight Marshal Dragon, Mithril-core Dragon works only if you have a “Trans-core” heart (Currently only Blue Flight Dragon, Trans-core Dragon). When any of your unit’s attacks hit a Vanguard on the third wave or more your opponent must choose between discarding a card or having you draw a card. This can get pretty intense with the amount of times Aqua Force can stand up and have enough power to land a hit. 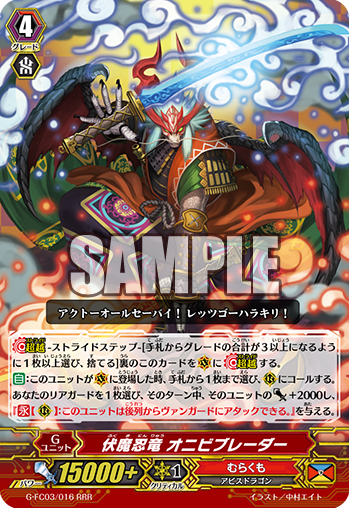 Stealth Rogue of Night Fog, Agitomaru is a Grade 2 for Nubatama with no specific support (Probably because the support for Nubatama in general is very slim) but his skill can prove to be very useful. When Agitomaru’s attack hits a Vanguard, retire a card in your opponent’s bind zone. Sweet and simple. This will work well in many Nubatama builds but what they really need now is a way to power up this guy to make sure that attack hits. This is the second rear-guard ability that allows you to retire from the bind zone but I feel Nubas deserve more so here’s hoping to more bind zone retiring in the Technical Booster! In this set there has been OTT Witch support, Shadow Witch support, and now we have Genesis Witch support. Sacred Water Witch Queen, Clove is just what you’d expect from a Genesis Witch, by Soul Blasting 6 you can give all units with “Witch” in their name +5000 power, and if you have two or more hearts she gains an extra crit. Like Evangeline, you can get some seriously strong columns with this. Not as big as Evangeline’s potential but with Clove you get the higher power quicker, you can use her four times in total, and she gets the extra critical. 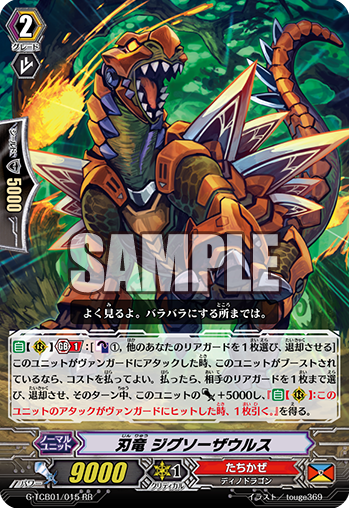 For the “Bad End” Spike Brothers rear-guard support we get the Grade 1 Death Flag Dragger. If he is placed on a rear-guard circle during your battle step then you may reveal a Grade 3 from your hand, and then search your deck for a “Bad End” card (Bad End Dragger) and put it into your hand. This will be good for getting the initial Bad End Dragger but with Hand of Deity, Good End Dragger you won’t be using Death Flag Dragger’s skill much late game. Love Sniper, Nociel is the Grade 3 that the “Nociel”s deserve. You may CB1 when a card with “Nociel” in its name is put into the damage zone, if the card that was put in the damage zone is still face up then you can put it into you hand and put the top card of your deck into your damage zone. She also has a second ability that allows you to put a card from the damage zone into the hand when she’s placed on Vanguard circle if you put a card from your hand into the damage zone. This is really the kind of thing you would expect from a Nociel card and now that she’s got a form in every Grade you can finally make a proper deck around her. Lastly for Fighter’s Collection we have the Granblue Grade 3 for “Seven Seas”. Seven Seas Sage, Purgeton has your classic Granblue skill of Riding from the drop zone. 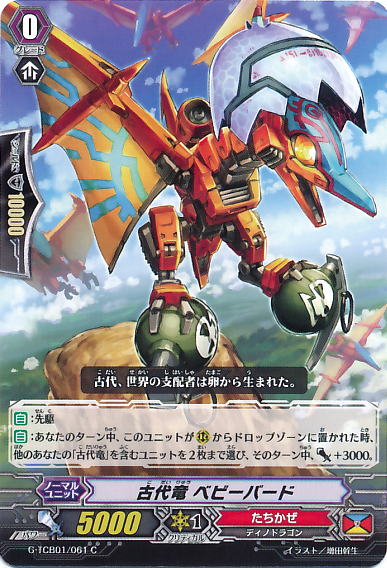 At the beginning of the ride phase, if you have a Grade 2 or greater Vanguard with “Seven Seas” in its name you can CB2 to bring this guy from the drop zone onto the Vanguard circle. Also, when he is placed on the Vanguard circle you can bring another card from your drop zone and put it on the rear-guard circle. This may be good to bring out King Serpent to essentially make the Ride and call a CB1 but using things like Sea Strolling Banshee for hand advantage may also be a good idea. That is all for Fighter’s Collection for this week however there are a few more cards to go over. Cheer Girl, Lucy is a new promo for Spike Brothers. We’re not sure how it will be distributed in the west yet but it has a neat ability to give a boosted unit with the “Charge” keyword +5000 power on top of the boosted power already given by her and then at the end of the battle that the boosted unit attacks you put them on the bottom of your deck. Lastly we have been shown the three stride fodders for the Technical Booster. Prism Bird (Tachikaze), Acrobat Verdi (Spike Brothers), and Stealth Beast, Katarigitsune (Nubatama). The only one that we know the Grade 3s name for is Katarigitsune who helps you find a card with “Shiranui” in its name. That’s all for this weekly update of Fighter’s Collection, promo, and Technical Booster cards. Be sure to check back next week for the next one! Welcome once again to the weekly Vanguard update! Fighter’s Collection 2015 Winter and G Booster Set 6 both get some love this week with a mix of clans in both sets. Robots of justice, dragonic ninjas, steam-punk time-travelling eagles, we’ve get ’em all today! 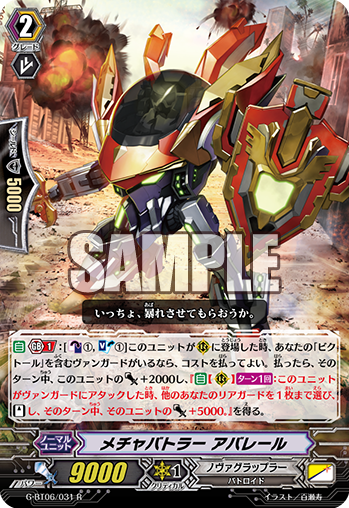 Legendary Dimensional Robo, Daikaiser Leon comes onto the battlefield to destroy your opponent’s guardians to follow the Kaiser tradition. 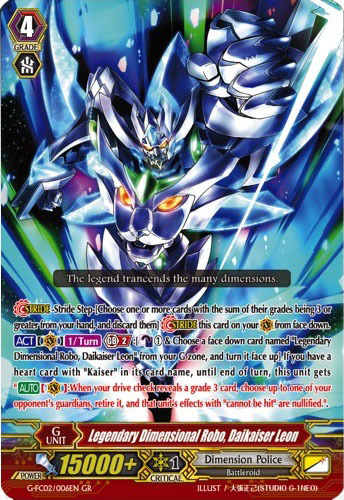 With a GB2, CB1, and G Persona Blast, if you have a “Kaiser” heart then when this card’s drive check reveals a Grade 3 you retire one of your opponent’s guardians, including getting rid of those pesky perfect guards. Of course justice doesn’t fight alone though! Daikaiser Leon has his trusty subordinates such as the Grade 2 Dimensional Robo, Daibazooka. When you have a “Kaiser” Vanguard Daibazooka gets +2000 power, but there’s more to him than just a simple power buff! Yet again if you have a “Kaiser” Vanguard, if you trigger check Daibazooka he gets an extra Grade making him Grade 3! So much Kaiser love for screwing up your opponent’s guard.. it’s so wrong.. but feels so right. Have a lovely Nightmare Doll Master, Brenda for a great addition to the Workroids of Pale Moon. You may put Brenda into the soul as an ACT to bring a Workroid unit and then you can give that new unit the effect of when it’s placed into the soul you can bring Brenda back out. Nightmare Dolls have a lot of flipping and flopping out of the soul these days, I’m hoping for an Upright Lion clone for the Nightmare Dolls to give them a nice boost in power. The ninjas are back in town for both Murakumo and Nubatama. Our Murakumo unit shows some support for the Hyakki cards (Well, when I say cards, I mean Hyakki Vogue “Яeverse”). 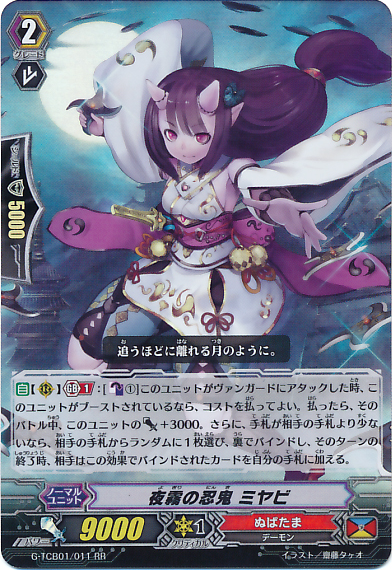 Ambush Demon Stealth Dragon, Hyakki Vogue Nayuta’s skill allows you to put a Hyakki rear-guard to the bottom of your deck and if you have a Hyakki heart you can clone one of your rear-guards and give the clone +10000 power and then put the clone into your hand at the end of the turn. You could even use this to have a 16k perfect guard guard that goes into you hand at the end of your turn, then rinse and repeat. The Nubatama is in support of Shura Stealth Dragon, Steel Blade Shura Stealth Dragon, Hayakujirakan. If you have a Shura Stealth Dragon heart and you CB1, you choose a card at random from your opponent’s hand and bind it face down. Then if the number of cards in you opponent’s hand is three or less your opponent binds all of their rear-guards face-up. This can disrupt your opponent’s plans of intercepting and with Stealth Beast, Kuroko you can kick your opponent when they’re down by retiring two cards from the bind zone if the attack hits. There’s something very exciting regarding Spike Brothers in this Fighter’s Collection. Hand of Deity, Good End Dragger allows for some great support towards what many would say to be the best card in Spike Brothers. You may CB1 and put a card from your hand into your soul, if you do then at the end of the battle that this unit attacked and you have a heart with “Bad End” in it’s name (Currently only Bad End Dragger) you can search your deck for two Grade 3s and call one to rear-guard and ride the other as rest. This compliments Bad End Dragger’s skill to give your rear guards huge buffs and allows you to use Bad End Dragger’s skill several times in a game with ease. For Gear Chronicle we have a new Grade 3 that works wonders on the rear-guard and supports Chronoscommand (A nice break from all the Chronojet support). When Calling For Revolution Gear Eagle’s attack hits a Vanguard and you have a Vanguard with “Chronoscommand” in it’s name then you can Time Leap one of your rear-guards. Also, when you would stride with a Chronoscommand card you may put a rear-guard to the bottom of your deck and look at the top ten cards of your deck to put two cards with Time Leap from among them and put them into your hand. There is some seriously heavy support for the new Time Leap keyword so let’s hope that the other clans keywords get just as much of a good treatment. Now let’s quickly head to the Zoo nation for the last of the Fighter’s Collection cards for this week. Starting off we have Maiden of Waterpot who is a Grade 1. She can put herself into the soul and put a normal unit from your drop zone onto the top of your deck when a card with “Maiden of” in it’s name is placed on the rear-guard. If you do and your Vanguard has “Maiden of” in the name you may shuffle your deck, draw one and Counter Charge. This has a very broad use compared to the other cards in this set and without a GB1 or 2 this card can be used very early in the game. Finally for Fighter’s Collection we have the Great Nature Grade 1, Honorary Assistant, Mikesaburo. When this little kitty is placed on the rear-guard circle you can choose one of your other rear-guards. It gives that unit the skill to search your deck for a Grade 3 when it is sent to the drop zone from the rear-guard circle. This is believed to be support for a Chatnoir stride but we will still have to wait for the reveal of the Great Nature stride. Now it’s time for some sneaky G-BT06 reveals. The first one I will talk about is a new Granblue Grade 2 unit. Seven Seas Master Swordsman, Slash Shade gives Granblue a bit more of an aggressive angle by working from the drop zone to retire one of your Grade 1 or greater rear-guards if you have a Vanguard with “Seven Seas” in its name to then call himself to rear-guard. This has no Generation Break so if he’s in the drop zone you can call him if you have another copy of him on the Vanguard circle. Some more exciting Granblue news comes in the form of a simple reprint. Every Granblue player’s beloved Ruin Shade will be partaking in the new G-BT06 set with all new artwork. She has always been an amazing Grade 2 for Granblue and highly sought after for years and now that she’s being reprinted as an R, everyone’s dreams have come true. Allowing you to put the top three cards in the drop zone and gaining power on top of that to make her an 11k Grade 2 will let you beat your opponent with no mercy. Who would have thought that they would see the EB01 Pale Moon stand trigger, Hoop Magician, all grown up. Meet Hoop Master, an interesting new perfect guard for Pale Moon who’s first skill works like the old perfect guards with not being able to Counter Charge but she does have one trick up her sleeve. Her second skill has GB1 and when she is placed on the guardian circle you may CB1 to Soul Charge 1 and choose a card from the soul and place it on a rear-guard circle in the front row. This is Magia so the card has to go back into the soul at the end of turn but the new unit is given +5000 shield and the ability to intercept so you could bring out a Grade 0 and be intercepting for 15000 for a future attack on that turn. The Royal Paladin keyword has been revealed through Knight of Backwind, Selim. If you have a Vanguard with Altmile in its name he gains +3000 power so long as the conditions of GB1 and “Brave” are met. This new Brave keyword takes effect when you have three or less cards in your hand. This is an odd choice of skill to have for Royal Paladins and will make draw triggers a lot less used and can be a big hindrance, hopefully their skills will be worth it though. Selim’s second skill is very useful though, when he is in the deck he gets +1 Grade making him a Grade 2 allowing him to be easily searched by lots of G era cards. Ranunculus gets a new Forerunner with yet another little Neo Nectar cutie. 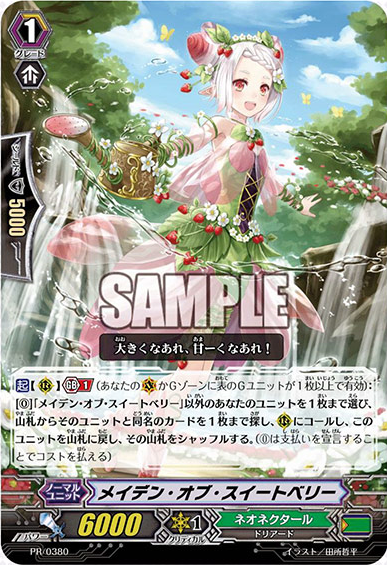 You may put Peach Orchard Maiden, Erumi into the soul if you have a Vanguard with Ranunculus as your Vanguard and if you do you choose one of your Grade 2 or greater rear-guards and clone it. At the end of the turn you put the new clone into your hand. 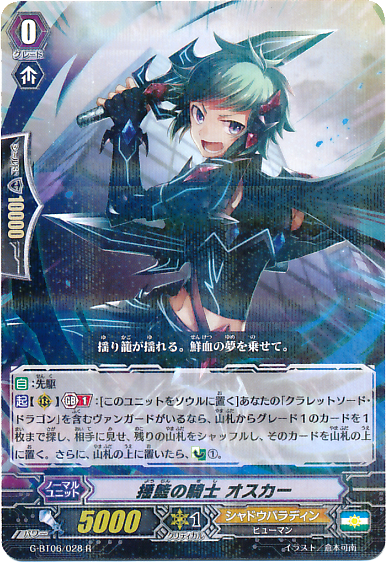 This is Counter Blast free which makes her cheaper to use than Spring-Heralding Maiden, Ozu though with Ozu you had a wider range of cards to choose from with her letting you clone a Grade 2 or less but also not letting you put it back into your hand afterwards. 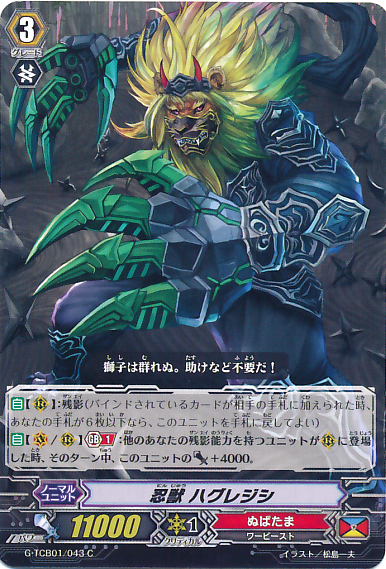 Beast Deity, Jackal Lord is a new Grade 2 and great support for the Beast Deities of Nova Grappler. When he is placed on a rear-guard circle you may CB1 and until the end of turn Jackal Lord allows you to stand another unit when he attacks and gives it +3000. You can perform nice combos with this and Beast Deity, Dragotwist providing you can spare the Counter Blasts. Last of all we have a Grade 2 Shadow Paladin, Darksaga Painter, who supports the Abyss build. With a GB1, when this unit is placed on the rear-guard, if you have an Abyss Vanguard you may draw a card and then discard a card. Also, when he is in the deck he gets a similar effect to Selim but in reverse, he loses 1 Grade allowing him to be easily called out with the new Shadow Paladin builds. That’s all for this weekly update of Fighter’s Collection and G-BT06 cards. Be sure to check back next week for the next one!